The Tor Project has always fought for freedom of speech and open access to the internet. To do so, it’s essential for us to reach people in areas in the world with heavy online surveillance and censorship, especially those in the Global South. Most people in these regions only use smartphones to access the internet, and we want to better support these users. So we developed a strategy to do better for folks who have low-bandwidth connections, limited data plans, or who can only connect to the internet through low-end devices. Eleven percent of smartphone usage around the world in 2014 was mobile browsing, so we knew giving better support to a mobile browser would be critical to this strategy. Around a year ago, folks from the Tor Project and the Guardian Project met to discuss the future of Tor Browser on mobile devices. The discussion began with Orfox, a Google Summer of Code (GSoC) project for mobile browsing over the Tor network. Since then, we have been working towards Orfox having similar functionality and security guarantees as Tor Browser for desktop. 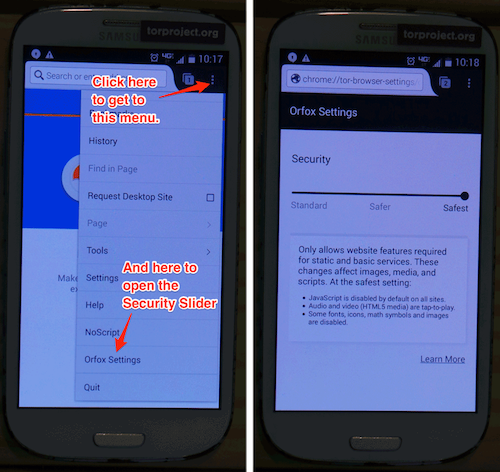 Our first improvement was to port the Security Slider from Tor Browser desktop to Orfox. To adapt this feature from a desktop application into a mobile application, we had to change how the UI works for the mobile screen. The UX Team and the Guardian Project collaborated on this effort iterating on mockups and reviewing UI copies, until there was a version everyone felt was good enough to be build. Once it was up and running as a beta, the UX Team ran a validation test to see if this interface and copy made sense to users. With the help of Amogh, an Orfox developer, we tested our UI with 12 users in India and 3 others in the U.S. We used this feedback to improve our copy and iterate on the slider UI. This was the first time Tor did a full development cycle following UX best practices, such as being involved with the conceptualization of the UI and performing user testing to validate our hypothesis. Since we don’t collect data on user behavior, we had to build a testing methodology so our community could help us perform these tests with our users. We are now applying UX best practices to all of our development cycles. The newest version of Orfox is available from the Google Play store or download the apk installation file from our git repo or get it at F-Droid store. If you use Android, download it or update your current app to check it out. To see what we discussed here, open the settings menu and scroll down to the ‘Orfox Settings’ option. As always, we want your feedback! You can use the comments below. Mobile is becoming a core part of our development thinking at Tor. We will continue to work with Orfox, and when the Tor Browser Team comes up with a new feature, we’ll be thinking how we can make it work on mobile as well. We’ll keep publishing updates like this about our efforts to improve mobile experience, especially for those in the Global South. We hope to have it done in one year timeframe and once that is complete the rebranding will take place. Are there plans to bring tor and and the tor browser to iOS? There were articles a few years saying people were working on software that would allow you to torrify the iphone. I need to check when the F-Droid will be updated, I don't have that answer right now. Why should downloading OrFox from the play store be avoided? I’m new to this so please forgive my ignorance. The Guardian Project fdroid repo has the current release of Orfox already, v1.4 RC 3. Is Thomas Rientjes the same person behind the awesome Decentraleyes addon? I can confirm it's the same person. Username checks out. I get iPhones are not really low-end market and a lot less popular in southern hemisphere compared to Android, also having a closed source OS... but is Orfox or an official TBB for iOS considered by the team? We don't have an official browser for iOS, although we do recommend Onion Browser - you can check them out. When will you update the F-Droid version? We need it fast, don't want to use insecure outdated software, but also not crappy Google Play. How many lizards do you have working with you? I hope zero because the lizard people aren't our friends! Our alt-right moles confirm: the TLAs are staffed by reptilians! With lizard people i assume you mean the joos? Great, as I have been eagerly awaiting simpler security settings! Before, I had to manually tweak site specific NoScript preferences to get some particular pages to work. This helps a lot, and it's working very well for me. It's also nice to read that there are more improvements in the works. We have updated Orfox on F-droid and you should be able to find the new version there as well! Thanks Bagueros for always thinking about the user first : ) ! Also huge thank you for giving attention to android! I know you guys are busy with more important things but it just seems orfox has been a little neglected in the past year or so. Glad to hear that's about to change! Okay I can see 1.4-RC-3 has the highest version number, but 1.2.1 was released 29 days later. I guess it could be that 1.4 is still an experimental branch, and 1.2.1 is a stable branch that received backports almost a month later, but then I still don't know which one is recommended. i cant download the orbot application from the repo in fdroid atm, but orfox downloads just fine, am i the onlyone with this? - Android language setting is leaking into HTTP_ACCEPT header (try on panopticlick.eff.org). Test it for yourself: change Android OS language to anything other than EN_US and it will show. On non-English desktop TBB, the user is specificall asked if they want the site to know their language setting. Thanks for reporting this. I fwd to the team. userAgent should probably be updated to version 45 now as well, as some sites (github for example) show warnings for outdated browser versions. Thanks for reporting this issue. I fwd it to the team as well. Do you think it is possible to make this an iOS tweak/app via Cydia with a jailbreak? This is an essential and long-awaited development. Many thanks to the Tor and Guardian Projects for this critically important collaboration! I've updated the Orfox browser, but don't see the "Orfox Settings". What's could be the issue? Same with me on android 5.1, does it work only on android 6+? and Orbot-v15.4.1-RC-1-MULTI if it is of any interests. Easy to use with slider i.e safe /safest . just now i downloaded tor browser from playapk.org , may be it is available in other play stores . In some countries these apps are locked . Any chance of a kindle edition, with it being Android? Could you please develop a Tor app for WIndows Phone 10 users! Unfortunately the lovely people at Google have implemented massive identity leakage so that through any given network connection, the device is constantly phoning-home to Google's servers. Even on, in my limited experience, Cyanogenmod without Google Play Services... Which is far from OK. Or private. What TOR can do is anonymise you partially through the 'pipe' from your browser to a given point on the internet so that harvesting data and tracking at THAT end is harder to do. Unfortunately Google still sees a data connection coming from your device through whatever network (VPN included) and logs it. So your journalist friend is only halfway there. She needs a device that simply doesn't phone home at all. Or at least without permission. I.e. something like a MAC-spoofed Linux laptop, hardened for security (TAILS leaves traces on a USB stick, even after wiping and formating it - little-known fact, honeypot shortlist fans - may as well use a fast, tiny disposable one that can be broken under the heel with one blow and flushed/burnt in an instant and do these exist on the market? )... and running through TOR and a VPN etc. I'm no expert. Privacy just gets to be a mission in and of itself! Hey so im trying to use Orfox but every... Lets say month or so it goes from working fine to just not loading any pages whatsoever. I get this "browser has timed out" related message and nothing ever loads more than 1/4th of the way according to the orange load status bar at the top under the address bar. I also cannot select the "Orfox settings" tab in the dropdown menu. It immediately goes to "the address wasnt understood"
What can i do to fix this besides continually uninstaling and re installing which doesnt always work. Yes, Joker...privacy becomes an end in itself. Don't get discouraged. This work matters.